2014 will be remembered as the year J.K. Rowling's Harry Potter first cast its spell upon our family. My oldest daughter read through all the books with a group of friends at school. Her enthusiasm for the books prompted my oldest son to ask for me to read him a chapter every night until we finished the first three books of the series. 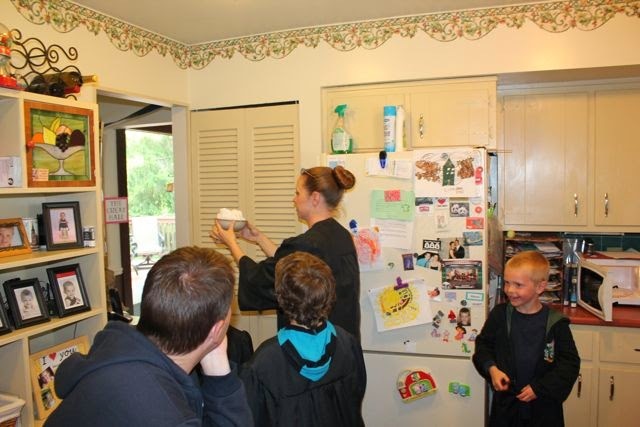 Even my little ones joined in the excitement by running around the house yelling, "Wingardium Leviosa!" 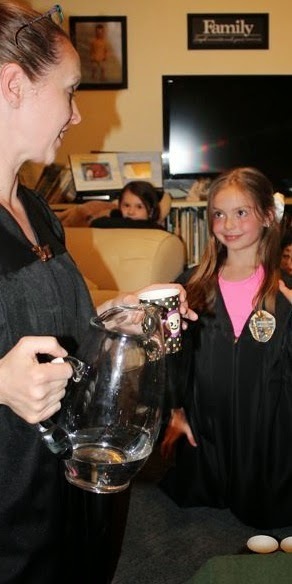 In early April my daughter hinted at her desire to have a Harry Potter birthday party (her birthday is in May) and invite all her friends that read the books with her. 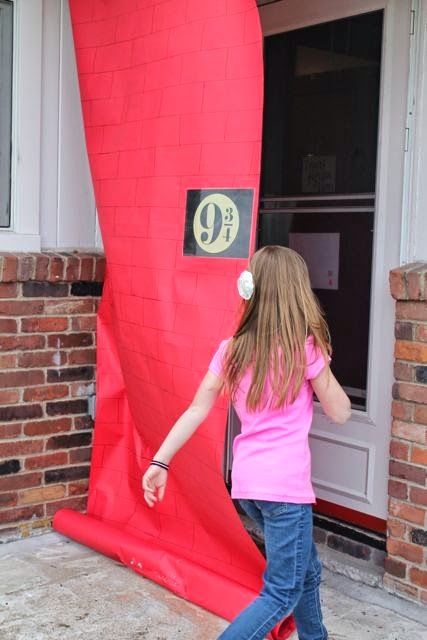 My wife decided that if we were going to have the party for a bunch of third graders that knew everything about Harry Potter we would need to start planning immediately! By the middle of April she had poured through Pinterest for ways to pull off the party on a budget. 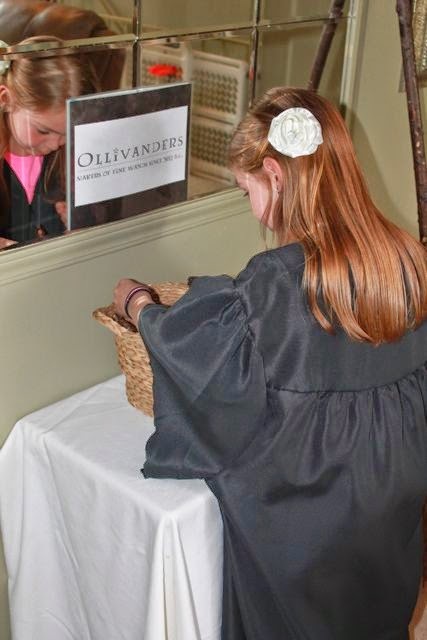 We were so thankful for the many friends who provided materials at no cost like graduation gowns for cloaks, chopsticks for wands, and unique glass bottles for potions! 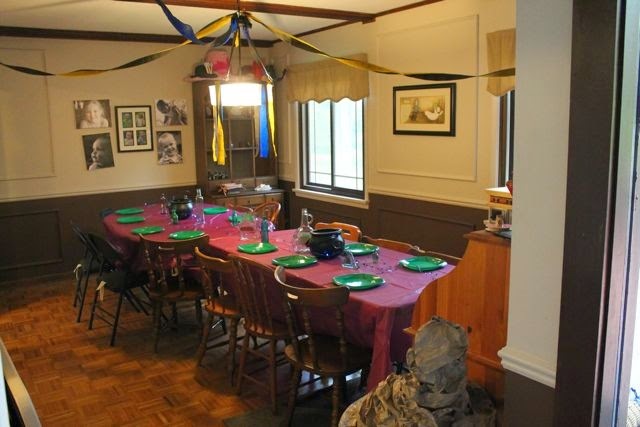 This party turned out to be an amazing 9th birthday party that my daughter (and her friends) will never forget! 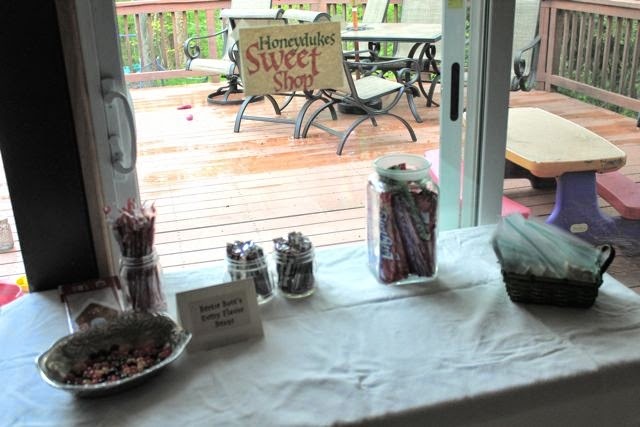 The first project was to make wands for every child that would attend the party. My wife found instructions on Pinterest, but below is how we made them. 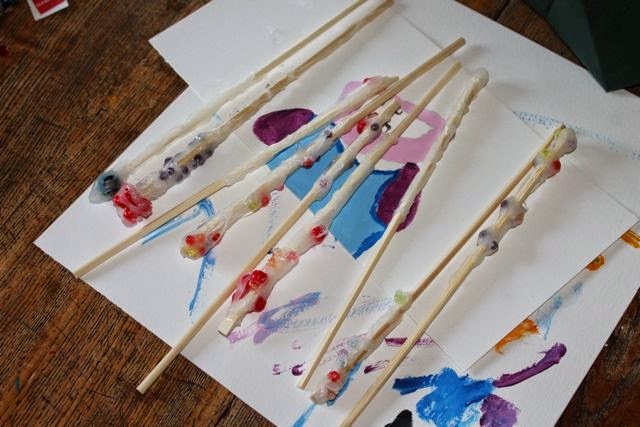 Wooden chopsticks, hot glue, and plastic beads were used to make wands for every child to use at the party and then take home once the party was over. My wife broke apart the chopsticks. 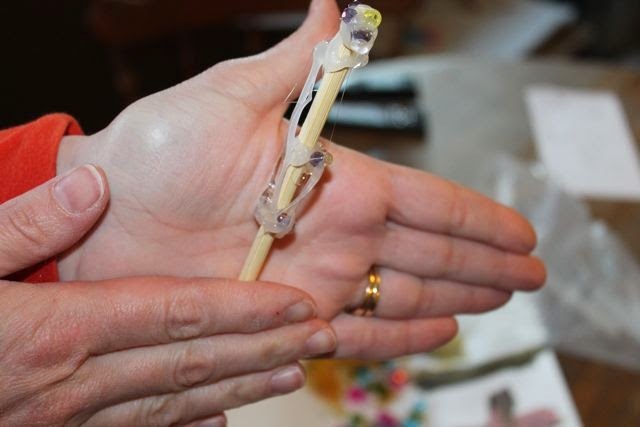 Then, she covered the bottom of the chopstick with hot glue. To cool the hot glue she rolled the chopstick between her hands. She added beads and more hot glue until she reached a unique shape for each wand. 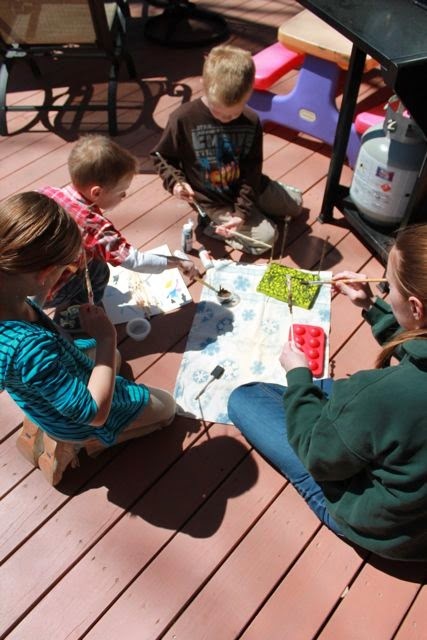 The family had a painting party once the hot glue was dry. We used inexpensive acrylic brown paint. 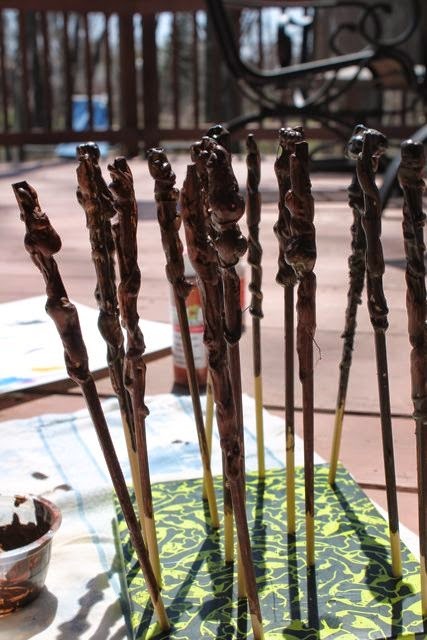 A cake pop holder was used to hold the wands upright to dry. 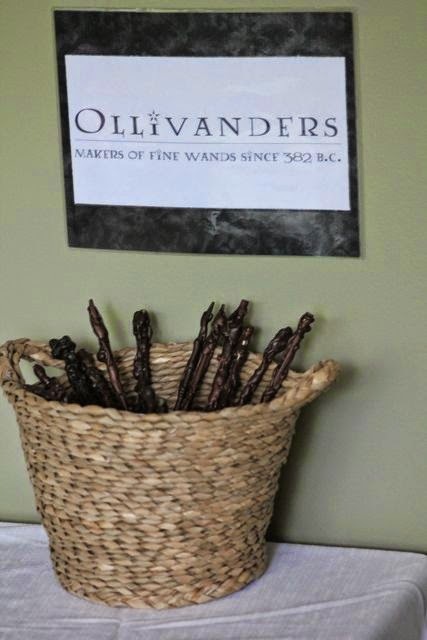 On the day of the birthday party each wand chose a wizard at Ollivanders. I found a decorative broomstick at garage sale. 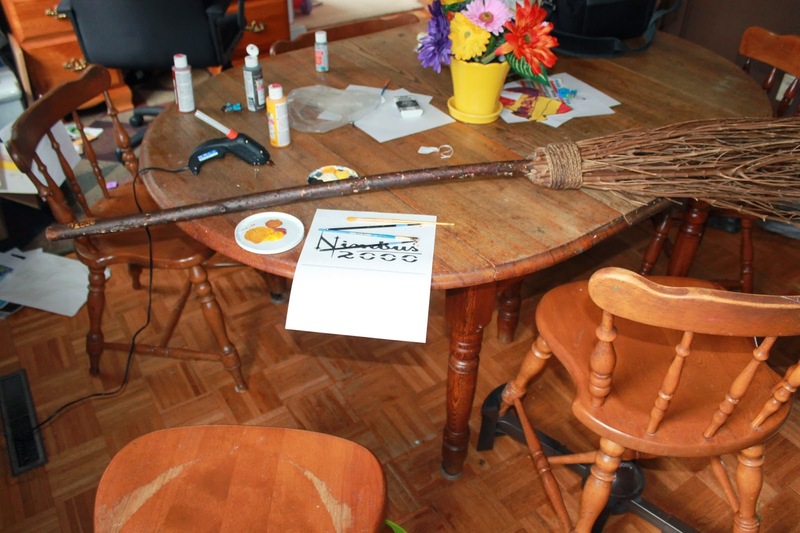 I added a coat of brown paint on the handle and a Nimbus 2000 logo in gold paint. 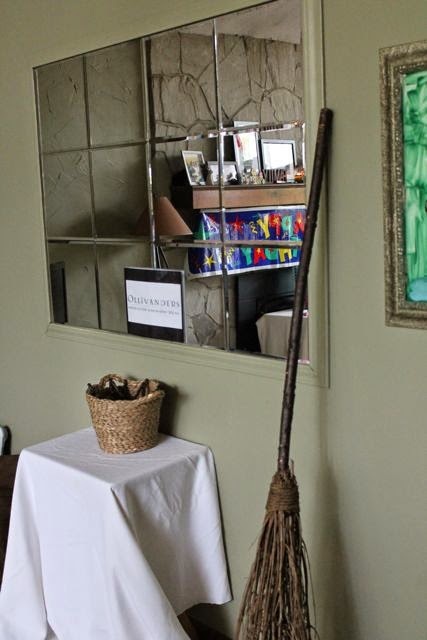 I couldn't wait until the party to give this to my daughter, so she received the Nimbus 200 on her actual birthday! The Nimbus 2000 was ready for a Quidditch match. My wife harnessed the power of Facebook to put out a request in search of small glass bottles. A friend responded that we could have all of these unique glass bottles of all shapes, colors, and sizes. Wow! All these bottles needed were aged labels. Those were found on Pinterest too! 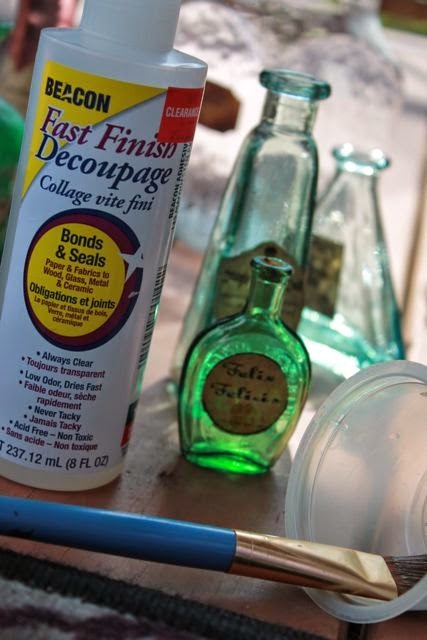 The labels were printed on parchment and decoupaged onto the bottles. 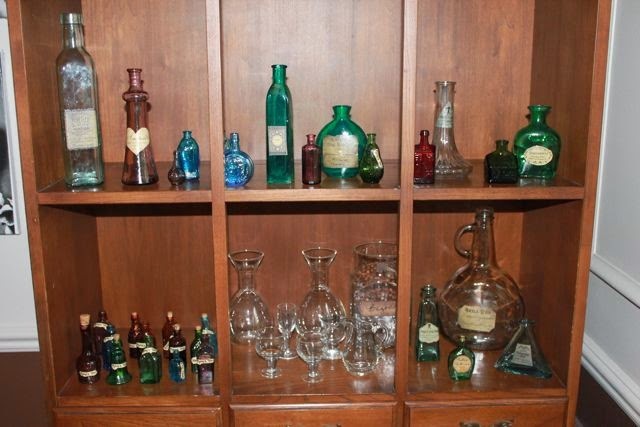 Our potions cabinet -- Snape would be jealous! The bottles in the bottom left were labeled "Phoenix Tears". Every child who attended the party would receive one of these to take home. 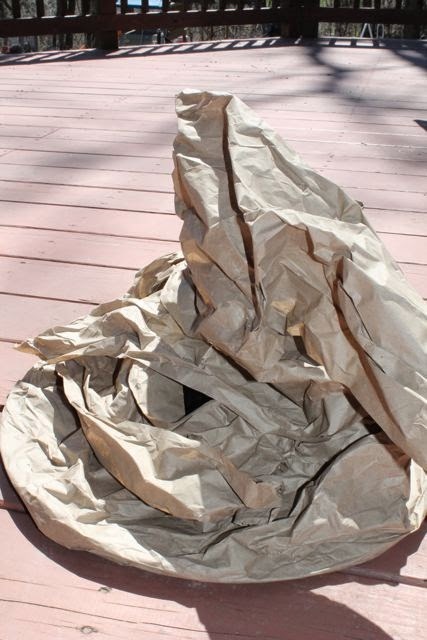 My wife envisioned the party to have a sorting hat ceremony, so she needed to make THE SORTING HAT. She found this pin on Pinterest to help! 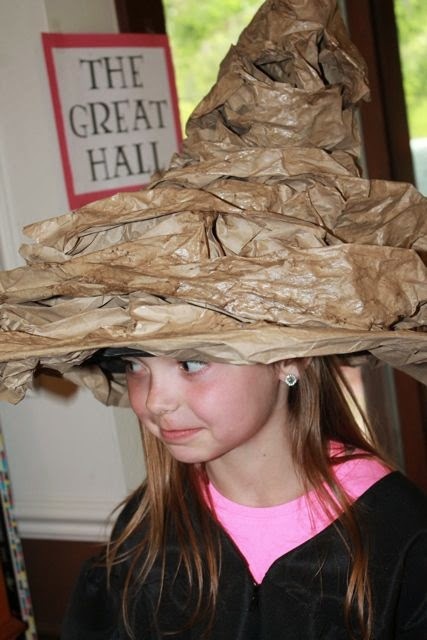 She started with a witch hat and covered it with a long piece of brown paper. We had this paper from a recent package that had come in the mail. 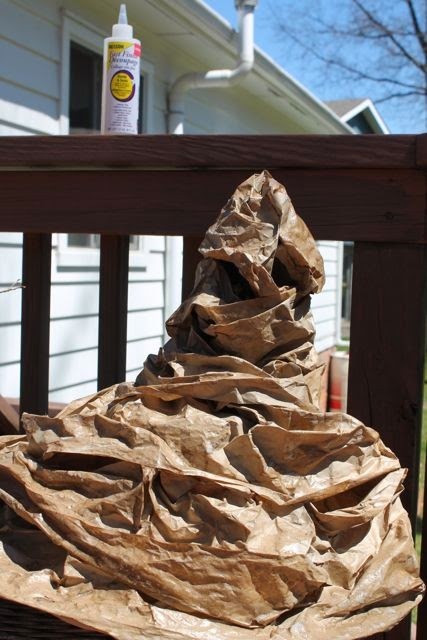 She wrapped the brown paper around the hat. 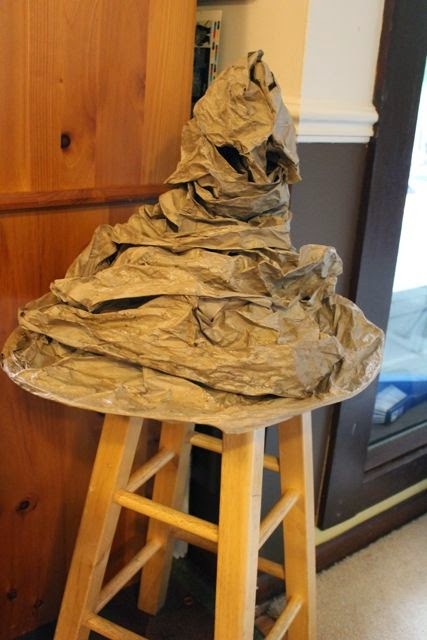 Then she stapled it to make it appear to have a face, just like the Sorting Hat in the books. 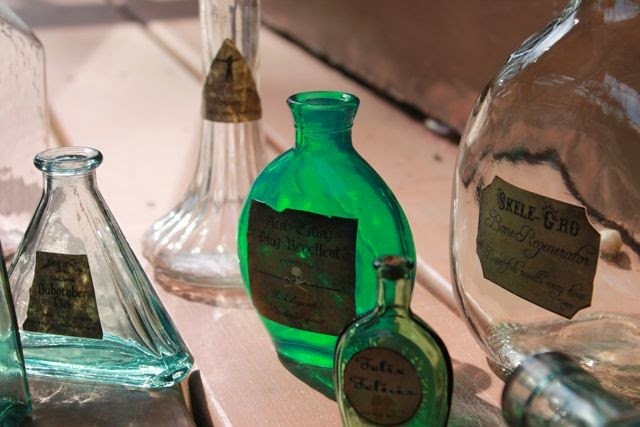 The brown paper was painted with thin decoupage that was also used for the potion bottles. It was painted on with a medium paint brush and left to dry in the sun. It took 2-3 different applications to make all the paper "stiff". 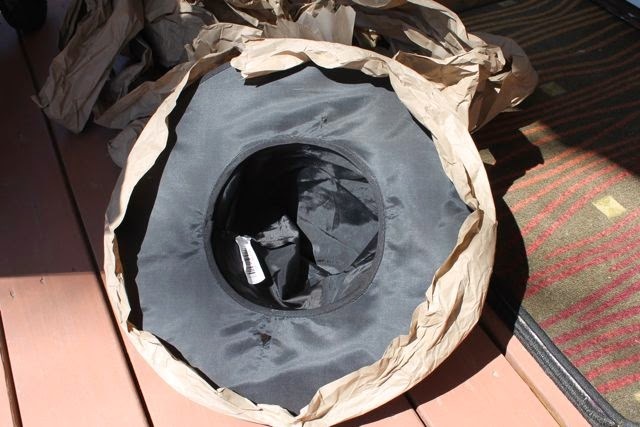 The Sorting Hat looked ready to sort the party attendees into Gryffindor, Hufflepuff, Ravenclaw, and Slytherin! My wife used a baby monitor inside the hat to make the sorting hat talk. I stood in the bedroom and waited for the signal from my sister that the group was ready. Although the baby monitor did not stay in the hat the whole time, after going on and off of 10 different heads, it worked well just placing it next to the sorting hat for the rest of the ceremony. My daughter wanted a cake decorated like the cake that Hagrid gave Harry for his 11th birthday. She saw this cake on Pinterest! 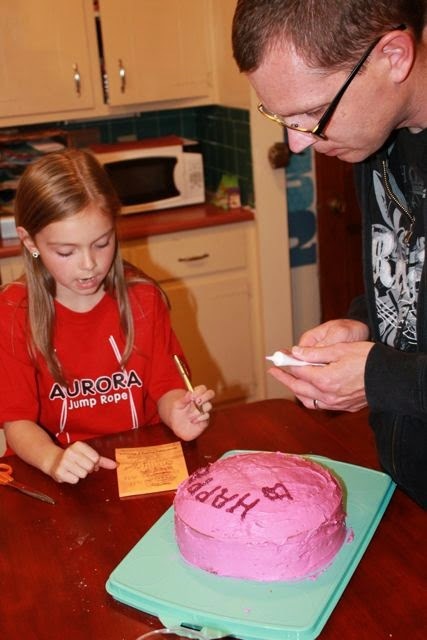 In this photo she is instructing me on the misspellings Hagrid made on the cake. I think she was happy with the results. This was our great hall. My wife went to the local thrift shop and found goblets and fancy glasses for dinner (pizza and chips). 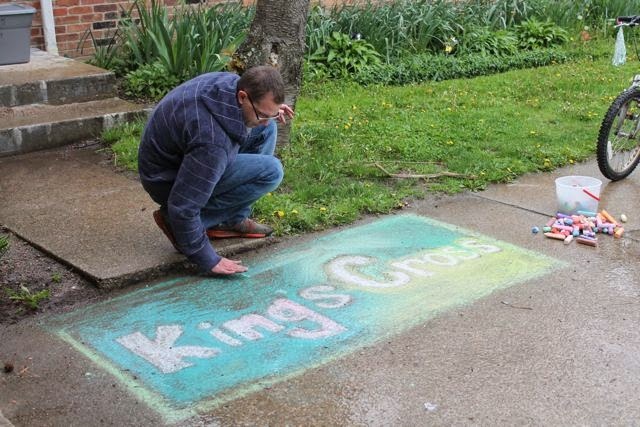 I made a King's Cross station sign with sidewalk chalk to greet the wizards when they arrived. After a month of preparation it was time for her birthday party! Every wizard was given a black cloak upon entering Hogwarts. My wife asked friends for their old graduation gowns. She cut the sleeves short and cut off the bottoms of each robe. The kids got to take the robes home with them too! They also visited Ollivanders for their wand that they took home too. 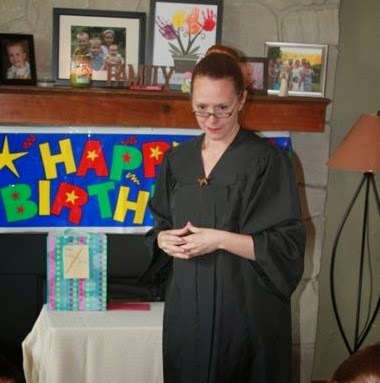 My wife dressed as Professor McGonagall and provided the house rules for the day. 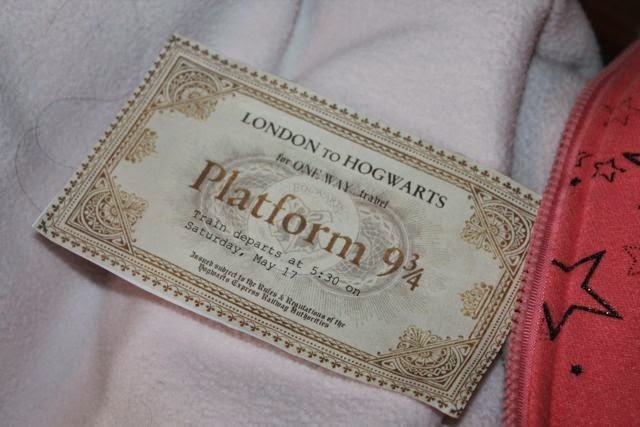 The sorting ceremony took place in The Great Hall. We used a baby monitor to announce the sorting. 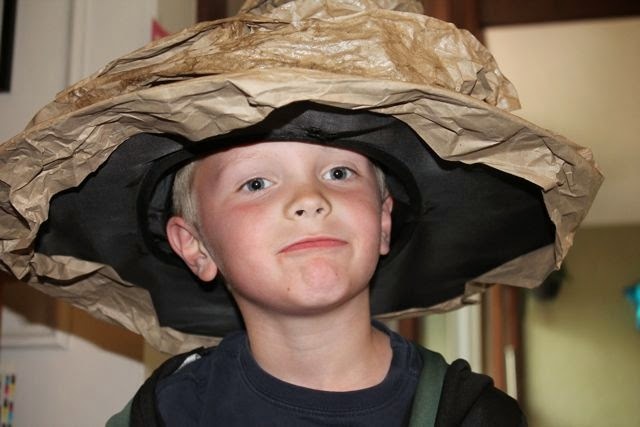 I was lucky enough to be the voice of the sorting hat to read the script my daughter wrote. My daughter was sorted into Ravenclaw. My son was sorted into Slytherin! We pinned house crests on their cloaks after they were sorted. Then it was time to feast! After the feast came Transfiguration class. We transfigured Ivory soap in the microwave. Divination class predicted every one's future. Before the party my wife put a small amount of food coloring in the bottom of a cup and it dried before the party. As the children assembled downstairs, they were called up to the front of the class. A small amount of 7-up was poured into the cup. The color that the soda changed to predicted the student's future. (Directions for this can be found here). 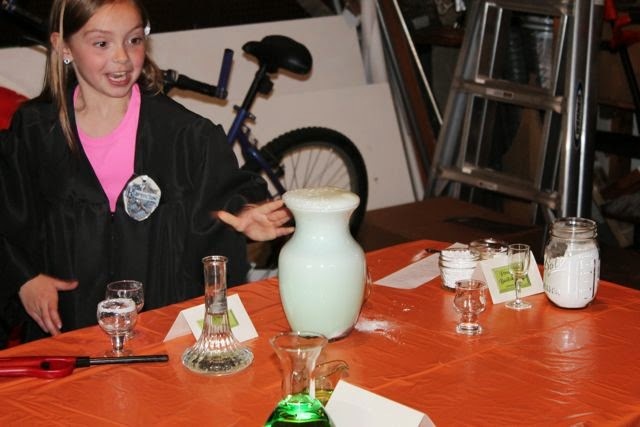 Potions class provided lots of excitement! My wife made labels, using Harry Potter style fonts, for the materials. 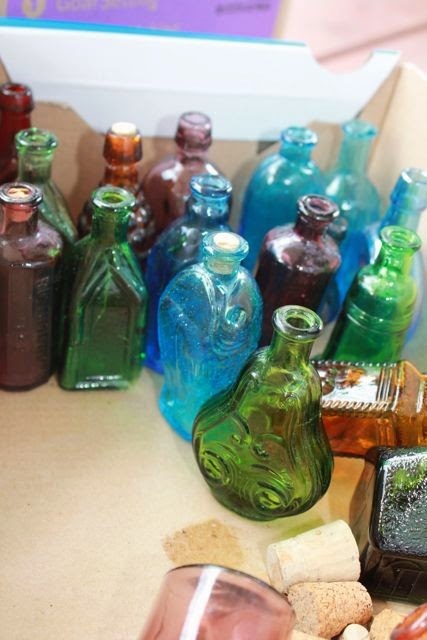 Baking soda became crushed bicorn horn and green food coloring and vinegar became dragon blood. The students used their wands to place spells as the reactions occurred. We did this class in the garage! 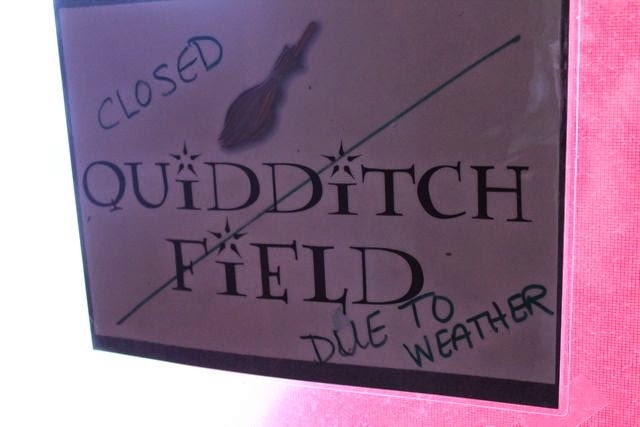 Quidditch was cancelled due to weather, but I don't think we would have had time for a match anyway. Everyone filled a bag full of goodies from Honeydukes Sweet Shop before they left. We had traditional sweets, but then we also made chocolate owls! 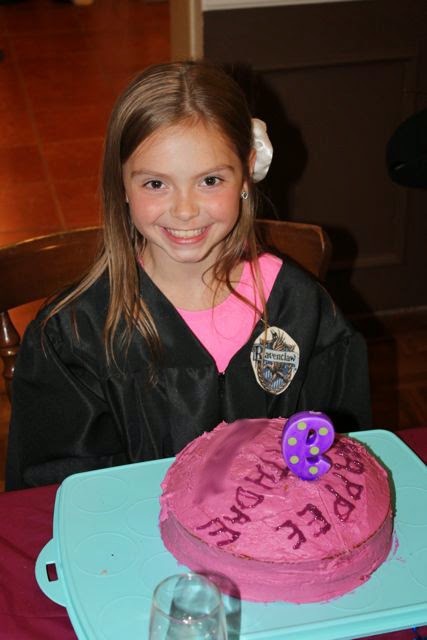 It was an amazing birthday for my daughter and it was fun reminiscing today on J.K. Rowling's birthday. Rowling's birthday has peeked my son's interest in starting to read the series again. Will we reread the first three books or start The Goblet of Fire? I'll let him take the lead! 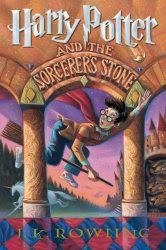 Did you know that today is Harry Potter's birthday too? Scholastic is celebrating with a virtual event today July 31, 2014, starting at 12pm EST! Click Here to find out more!